Today I’m not writing anything at all. I’m a grown up! And this is my blog. I don’t have to. One thing I will say is that this pie is absolutely delicious. Easy to make and even easier to eat. Really! That’s all I’m going to say. Position oven rack to the lowest position, place a baking sheet on the rack and preheat the oven to 500°F. Have ready one 9-inch pie plate. Combine the flour and salt in a large mixing bowl. Using a fork, stir in the oil until the mixture resembles coarse crumbs. Sprinkle the milk or water over the flour mixture, tossing gently with the fork to lightly moisten. The mixture should be evenly moistened, not damp or soggy (add more flour or liquid as needed). With your hands, quickly form about 3/4 of the dough into a ball (reserve the rest for the crumble topping), handling it as little as possible. Starting in the center of the pie dish and working your way out, firmly press the dough onto the bottom and all the way up the sides. Place pie dish in fridge to chill. 2 medium to large apples, cored, cut in half lengthwise and then in half again, and sliced thin. Place in medium bowl and immediately squeeze juice from 1/2 a lemon and toss to coat. Combine the strawberries with the apples you’ve already prepared with lemon juice. Add sugar, tapioca flour, and gently toss to evenly coat. You want all the tapioca flour to be incorporated. If you like a health citrus injection in your food, add the juice from the other half of the lemon (you may want to taste the filling mixture before doing this to see how tart it is). Pour the filling into the chilled pie shell and spread evenly. 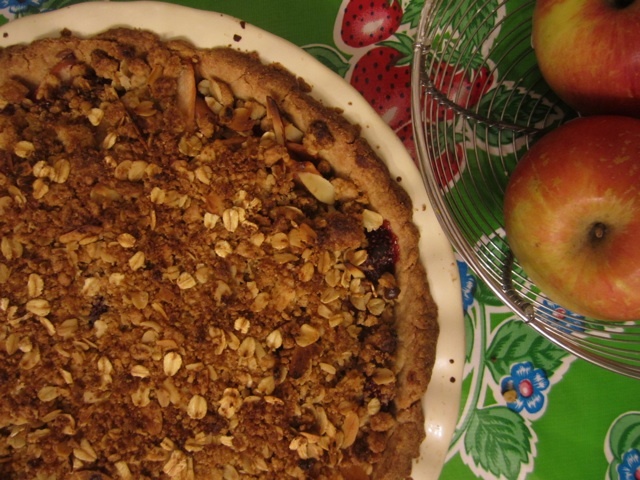 Now make your crumble topping. Combine all ingredients in a medium bowl and mix vigorously with a fork to incorporate well. You want the topping to resemble course crumbs. If it looks sparse, add more flour, oats, nuts, or sugar as needed or desired. There is no science to this part, as long as the mixture is damp enough to form clumps (add more oil, water, or almond milk as needed). Evenly sprinkle the crumble topping over the fruit filling. Place pie in the oven on the heated baking sheet on the lower rack. Immediately lower the temperature to 425°F and bake for 45-50 minutes, until the crust is browned and the juices bubbly. If the crumble or crust starts to brown too quickly and looks like it will burn, lay a piece of foil over the pie as it finishes baking. If you can wait for it to cool completely (or at least substantially) before eating, this will allow the filling to set up. 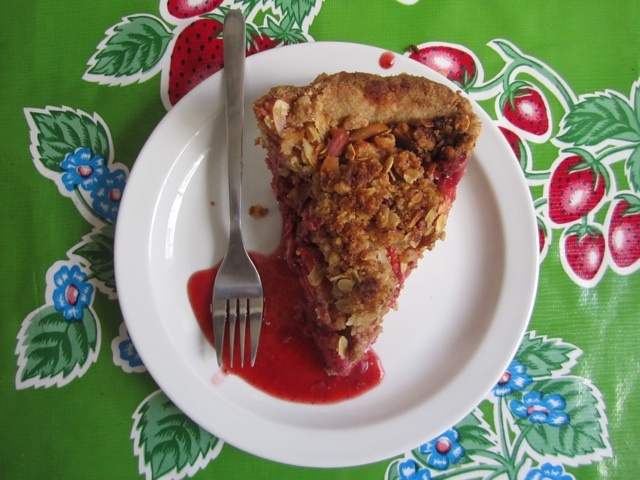 If you don’t mind a real oozy pie, then by all means – slice into it right away! 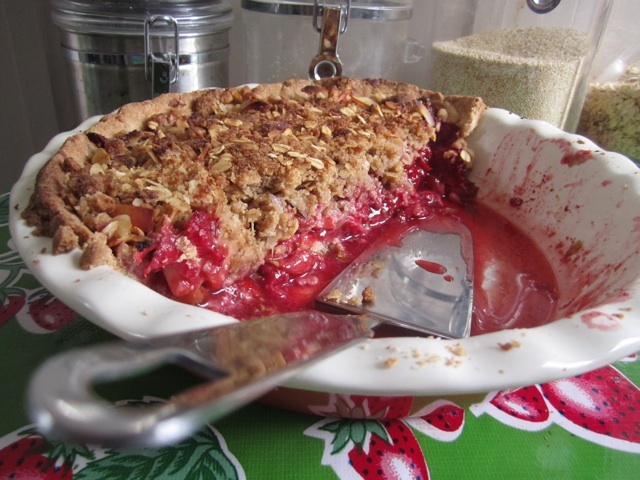 This entry was posted in Pie, Vegan and tagged apple, crumble, pie, strawberry, vegan. Bookmark the permalink.